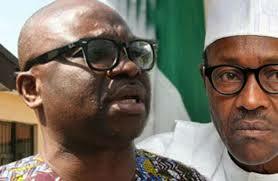 The Peoples Democratic Party has raised the alarm over what it called an illegal plot by some members of the ruling All Progressives Congress, to oust Ekiti State governor, Ayodele Fayose. Mr. Fayose, who has been having a running battle with the members of the State House of Assembly, had obtained a court order restricting the members from proceeding with the impeachment process. The Acting Chairman of the PDP, Uche Secondus, while addressing a retreat of elected lawmakers under the party holding in Port Harcourt this morning, said the Ekiti lawmakers “are presently camped at a location in Osun in preparation to be moved to Ekiti”. Mr. Secondus said the party considered it illegal and a test of its patience if the Ekiti lawmakers and their backers will be allowed to make real their intentions. Mr. Secondus, in a reaction to brickbats that followed the party’s abysmal performance in the last round of elections, called on members of the party to bring an end to the blame game and face the task of rebuilding the party. He said the PDP plans to rev up its research and communication units to reposition itself as a formidable opposition party.